Planted in 1963 it was the first of the new generation vineyards, the Yarra Valley having been an important grape growing area in the 1800s. The impetus for the vineyard began back in 1956 when Reg Egan married Bertina Curcio whose mother was English but whose father was Italian. Wine and food were important in the Curcio household and so started a fascination with the history of wine in Victoria. Before long they had their minds on a vineyard somewhere in the Yarra Valley. The early vine plantings included all sorts of varieties, many largely unknown, for those early Australian wine growing days. Varieties such as crouchon, pedro ximenez, barbera and dolcetto. But it was the classical varieties that eventually won the day and in the 1970’s the vineyard was consolidated to focus on chardonnay, pinot noir, cabernet sauvignon, cabernet franc, merlot and petit verdot. Much of the existing cabernet sauvignon and merlot vines were part of the original 1963 plantings. 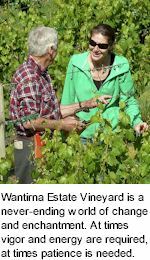 Wantirna Estate Vineyard is a never-ending world of change and enchantment. At times vigor and energy are required, at times patience needed. The winemaking is a joint effort between Reg and Bertina Egan and their daughter, Maryann Egan. These days Reg describes himself as the interfering winemaker but back in the early days everything was done by Reg, dashing from his legal practice to the winery to check on the ferments. Today much of the responsibility has been transferred to Maryann, who has a degree in wine science from Charles Sturt University. 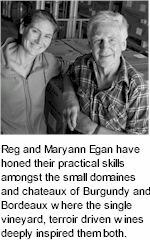 Both Reg and Maryann have honed their practical skills in amongst the small domaines and chateaux of Burgundy and Bordeaux where the single vineyard, terroir driven wines have inspired them. Maryann was also a winemaker for many years in the early days of Domaine Chandon. Bertina keeps accounts sorted out as well as that all important role of looking after the pickers at vintage time. Like all small wineries it is a family affair with everyone involved in some way during the year. Continuing the tradition, all the extended family still gets involved in the vineyard life - whether it is picking the grapes, helping to prune or looking busy riding the motor bike. Reg Egan started life as a farmer’s son in the small country town of Tolmie in northeast Victoria. Many years as a Melbourne lawyer then followed during which time Reg and Bertina planted Wantirna Estate. In 1984 Reg gave up the law to concentrate on the vineyard. For many years Reg and Bertina travelled to Europe looking at vineyards, visiting winemakers and thoroughly immersing themselves in the European wine culture. Reg’s love for the land is evident at the property. Native plants complement old-fashioned roses, fruit trees and olive plantings. Maryann Egan had no choice to becoming a winemaker…really. After completing her degree in physical education, she took off to backpack around Europe. Then running short of money around vintage time, it seemed the perfect moment to re-acquaint herself with the winemakers she’d met as a child, and to get some paid work to fund the rest of her trip. After a vintage in Burgundy, Maryann returned to Australia to begin her Oenology studies at Charles Sturt University. For the next six years Maryann worked at Domaine Chandon making both sparkling and table wines. After the birth of her first child Amelia in 1996, she returned to Wantirna Estate. Along with her commitment to the winery, Maryann has been a wine writer for Gourmet Traveller WINE magazine, wine editor for Donna Hay magazine and a presenter on the SBS series The Wine Lovers Guide to Australia. Today, Maryann tries to manage the occasional visit to the vineyards of France with her family – Justin Robison and daughters Amelia and Hannah – as well as the odd trip in search of fresh powder snow. Reg is also a novelist with two books published to date – "Lottie" and "A Breakfast in Bourg". A third book is underway.